Individuals who do well in mathematics and science also often have good spatial skills. However, the predictive direction of links between spatial abilities and mathematical learning has not been firmly established, especially for young children. In the present research, we addressed this issue using a sample from a longitudinal data set that spanned 4 years and which includes measures of mathematical performance and various cognitive skills, including spatial ability. Children were tested once in each of 4 years (Time 1, 2, 3, and 4). At Time 3 and 4, 101 children (in Grades 2, 3, or 4 at Time 3) completed mathematical measures including (a) a number line task (0-1000), (b) arithmetic, and (c) number system knowledge. Measures of spatial ability were collected at Time 1, 2, or 3. As expected, spatial ability was correlated with all of the mathematical measures at Time 3 and 4, and predicted growth in number line performance from Time 3 to Time 4. However, spatial ability did not predict growth in either arithmetic or in number system knowledge. Path analyses were used to test whether number line performance at Time 3 was predictive of arithmetic and number system knowledge at Time 4 or whether the reverse patterns were dominant. Contrary to the prediction that the number line is an important causal construct that facilitates learning arithmetic, no evidence was found that number line performance predicted growth in calculation more than calculation predicted number line growth. However, number system knowledge at Time 3 was predictive of number line performance at Time 4, independently of spatial ability. 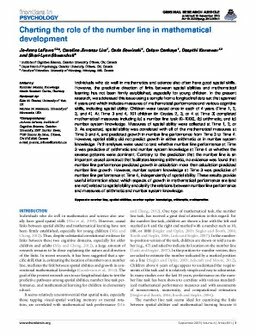 These results provide useful information about which aspects of growth in mathematical performance are (and are not) related to spatial ability and clarify the relations between number line performance and measures of arithmetic and number system knowledge.